The Hi5-12G converts 12G-SDI to HDMI 2.0, with pristine image fidelity and HFR support up to 60p for 4K/UltraHD, with single cable simplicity. 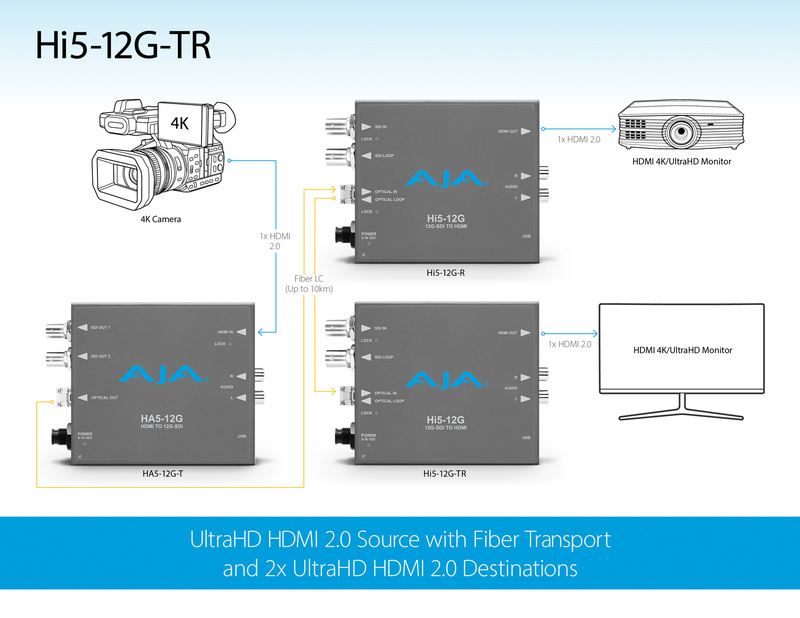 Hi5-12G provides an easy to deploy monitoring connection from professional 4K 12G-SDI devices to new displays with HDMI 2.0 inputs, for cost-effective monitoring in professional workflows. 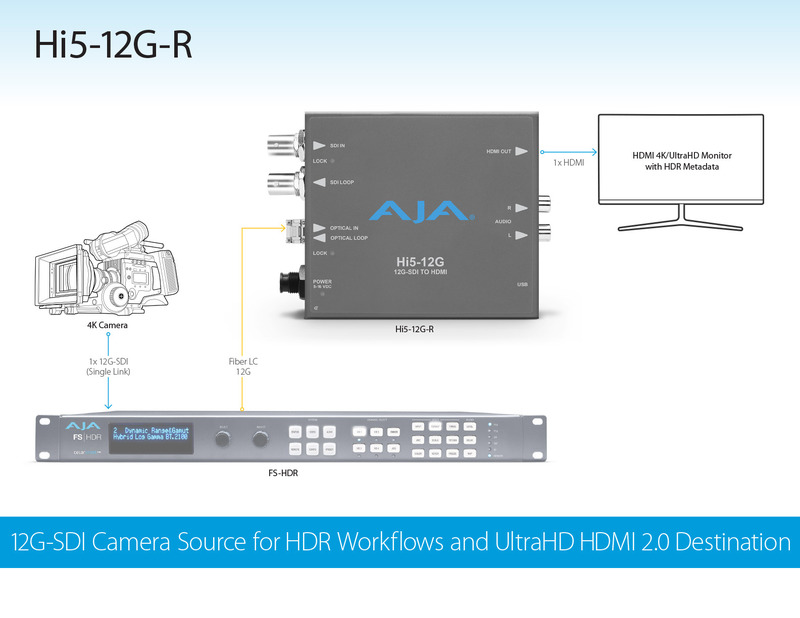 The Hi5-12G can also generate HDR metadata in accordance with HDMI v2.0 and CTA-861-G. 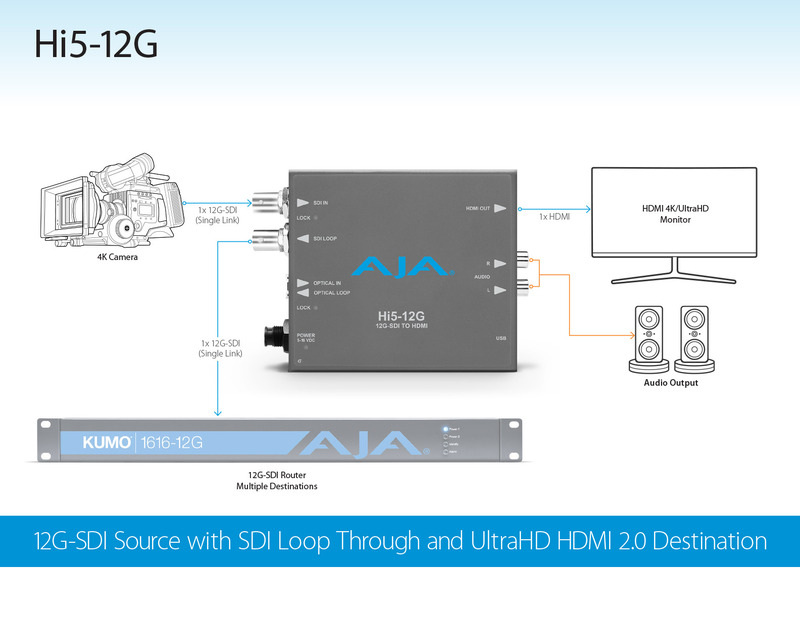 It features a 12G-SDI single link input with a reclocked SDI loop out for simpler SDI confidence monitoring or pass on for SDI pipelines. Fiber SFP equipped Hi5-12G models are available including the Hi5-12G-R receiver, which can receive 4K signals over long distances from a Fiber connected source, and the Hi5-12G-TR transceiver, which delivers a 4K/UltraHD SDI or Fiber source signal to an HDMI destination with pass on of the source through SDI or Fiber to a secondary destination. 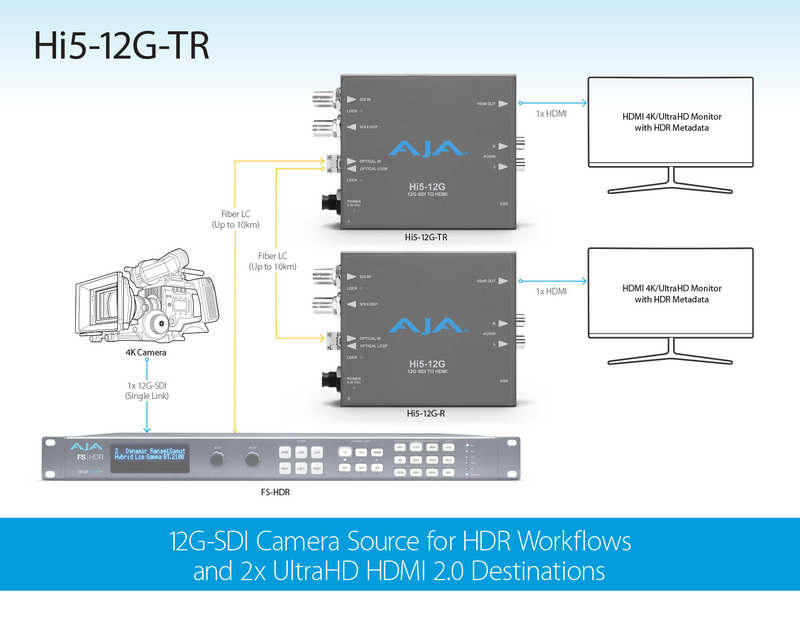 The Video Source Auto Switch Over feature (SDI and Optical Inputs) in Hi5-12G-R and Hi5-12G-TR provides automatic input changeover with configurable Switch Over Priority selection (Last Valid Input, Priority SDI, and Priority Optical). HDR, or High Dynamic Range, provides the ability to display a wider and richer range of colors, much brighter whites, and much deeper, darker blacks than standard signals allow. This gives your imagery a more ‘dynamic’ look and allows for natural true to life colors to be communicated to your audience. 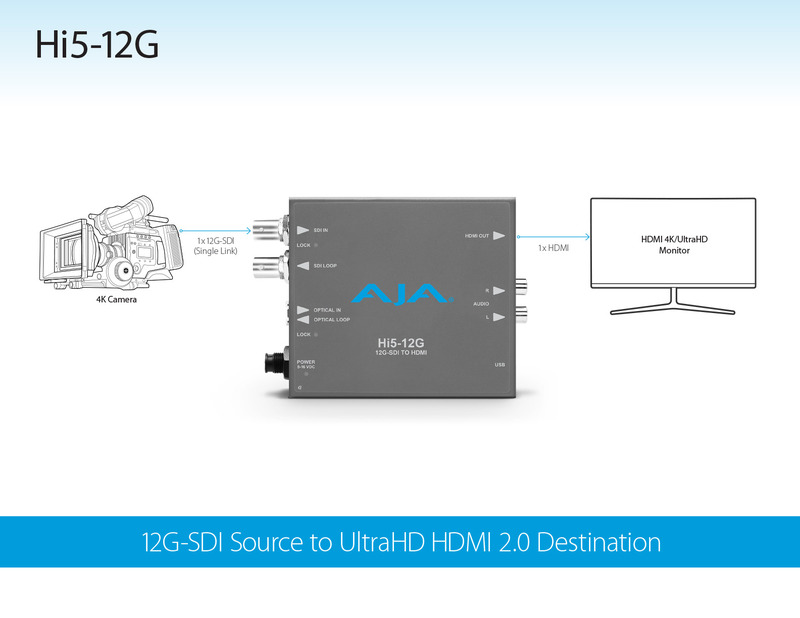 Hi5-12G provides this support for your 4K/UltraHD/HD HDR pipelines to HDMI compatible displays by generating HDR metadata in accordance with HDMI v2.0b/CTA-861-G. Hi5-12G also provides support for Hybrid Log Gamma (HLG) HDR displays over HDMI. Typical 4K signals use a resolution of 4096 x 2160 pixels while UltraHD signals measure 3840 x 2160. This difference can prevent some monitors from being used either in full 4K workflows or in UltraHD workflows. Hi5-12G can compensate for these resolution differences, allowing UltraHD monitors to be used in 4K productions and vice versa. Hi5-12G also supports High Frame Rate (HFR) inputs. 4K/UltraHD signals at 50 or 60 fps can be fed into Hi5-12G and output at up to 60p for viewing with appropriate HDMI 2.0 capable displays. 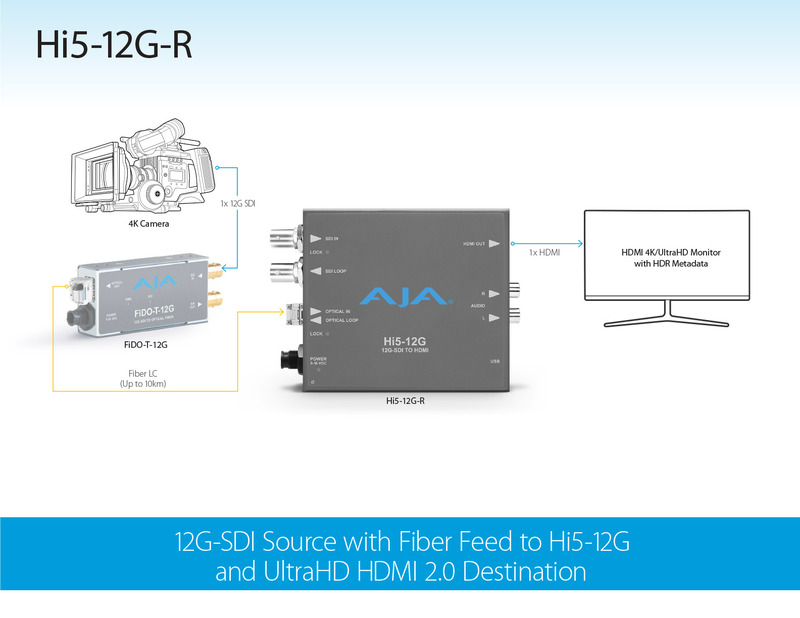 The 12G-SDI input on Hi5-12G allows extremely high quality signal representation through to the HDMI output for use with large raster and deep color workflows where image quality is critical. Up to 16-Channels of embedded SDI audio are supported on input and can be passed to 8-Channel of embedded HDMI audio on the output with the ability to delay the audio from 0 to 7 frames for proper synchronization with the output video. Two channels of analog audio output allow direct external monitoring without the need to disembed the audio separately. HDMI monitors do not natively support PsF signals. However, many professional productions still work with PsF formats. Hi5-12G converts incoming 1080PsF signals to 1080p. This progressive signal is compatible with HDMI monitors. *Hi5-12G devices use approximately 11 watts of power and convection cooling. They will be very warm to the touch, which is normal. When installing a unit, mount in a location where the device has access to air for proper cooling. Do not stack a Hi5-12G device with other Mini-Converters.